"The Witching Hour" was named the Best Non-Fiction Series of 2019 at the 10th Annual Indie Series Awards on Wednesday, April 3rd. Fairfax, Virginia — 04/04/2019 – Argos Paranormal is proud to announce that its show "The Witching Hour" has been named the Best Non-Fiction Series in the 10th Annual Indie Series Awards. The Indie Series Awards held its 10th annual ceremony at The Colony Theatre in Burbank, California, where over 30 awards were announced and given to the 45 nominated shows from around the world. The Producer of "The Witching Hour", Ryan Martinez, stated in the show's acceptance speech at the ceremony that "winning the Best-Non Fiction Series award is not just a success for me and everyone else involved in the production of the show, but this is also a victory for my fellow investigators in the paranormal community. This victory highlights our contributions to preserving the history of not only historical locations, but the stories of individuals who may no longer be here with us physically." This award also means that "The Witching Hour" is the first award-winning paranormal reality TV series in television history. The Witching Hour goes where no other paranormal show has gone before as the investigators of Argos Paranormal investigate the locations that the locals fear and no other paranormal show has ever dared to investigate. These investigators will be pushing themselves to their max limits as they investigate locations at around 3am, also known as the witching hour, when paranormal activity is believed to be at an all-time high during the night. Founded by We Love Soaps LLC's Roger Newcomb in 2009, the Indie Series Awards celebrate the best in independently produced entertainment created for the Web. Indie series are to Network TV series what Independent Films are to mainstream movies; innovation and creativity thrive and fanatical followers are the norm. The ISAs honor a genre that emphasizes artistic merit and social impact over corporate profits, however, the overall quality of the nominated shows is comparable to that of most TV sitcom or dramas—in fact, several past winners went on to partner with traditional television content providers. Fairfax, VA, January, 30, 2019 - The Witching Hour, a national TV series from Northern Virginia paranormal investigators Argos Paranormal, was recently nominated for Best Non-Fiction Series in the upcoming 10th Annual Indie Series Awards. According to the Indie Series Awards website, "The Indie Series Awards celebrate the best in independently produced entertainment created for the Web. The ISAs honor a genre that emphasizes artistic merit and social impact over corporate profits, however, the overall quality of the nominated shows is comparable to that of most TV sitcom or dramas—in fact, several past winners went on to partner with traditional television content providers." The Witching Hour is currently competing against four other nominees for the title of Best Non-Fiction Series and the winner will be revealed during the award ceremony on Wednesday, April 3, 2019, at The Colony Theatre in Los Angeles. Sign in the front entrance of Fleetwood Church. As you might already know, the Fleetwood Church in Brandy, Station, Virginia, was the location for the fifth episode of "The Witching Hour." If you happen to have seen the episode, you will have noticed that the church is in desperate need of repairs, and without repairs to things such as the steeple, the church infrastructure will collapse and result in the history of the church to be forgotten. Steve’s main priority right now is to preserve the steeple, which according to his GoFundMe, “is allowing a lot of water to pour endlessly into church when it rains which in turn causes heart wrenching destruction that destroys the original horse hair plaster.” With your contribution, Steve will be able to repair the steeple before time runs out. We know that money can be tight, but please know that even $5 will help Steve get closer to his goal of restoring the church to the glory it once was in the community. Ultimately, if we want future generations to enjoy a chance to come face to face with raw history, any and all donations would help pump blood into this very important jewel of Virginia history. The Witching Hour Ep3- "Occoquan Inn Part 1"
Fairfax, VA, November, 29, 2018 - Local paranormal investigators with Argos Paranormal and their new TV series, The Witching Hour, will be investigating the notorious Occoquan Inn in the upcoming third episode of the series, when it makes its second television debut on Sunday (12/02/2018) at 10 PM on CAM Erie. According to the episode description, "The investigators of Argos Paranormal travel to Occoquan, Virginia, to conduct an overnight investigation at the Occoquan Inn, where security alarms go off and shuffling footsteps are heard even though no one is there." Have you ever wondered what goes bump at night? Well, coming later this year, The Witching Hour will go where no other paranormal show has gone before as the investigators of Argos Paranormal will be investigating locations that the locals fear and no other paranormal show has ever dared to investigate. These investigators will be pushing themselves to their max limits as they investigate locations at around 3am, also known as the witching hour, when paranormal activity is believed to be at an all time high during the night. 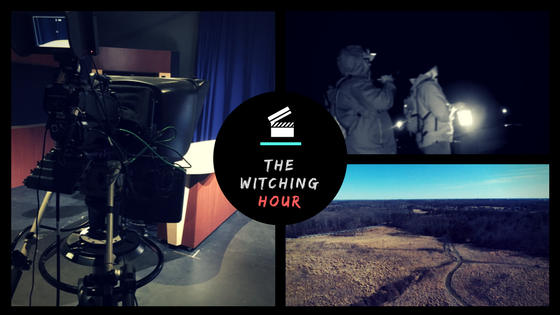 The Witching Hour will debut exclusively on Fairfax Public Access later this year with a first season consisting of 6 episodes. For more on The Witching Hour, stay tuned right here on the Argos Paranormal website and visit http://eepurl.com/dnMYlj​ to sign up for regular updates. Fairfax, VA, March, 12, 2018 - Local Northern Virginia investigators have banded together to form Argos Paranormal, a new paranormal group whose goal is to help local Virginia residents determine whether their residence or business is the site of unknown paranormal anomalies. Some of the members of Argos Paramoral have a background in media and investigative journalism and have gained acclaim for their investigations at locations such as Gettysburg, Pa, St. Albans Sanatorium, and various locations within the Manassas Battlefield through the online show Haunted Republic. All of the latest news and updates about Argos Paranormal can be found here.